In the College of Mass Communication and Media Arts (MCMA), we support students as they become media artists, critical thinkers, and members of the global community. We are committed to educating students across media platforms in both the foundational theories of their disciplines and the hands-on application of their fields. Whether you want to be a screenwriter, film director, audio engineer, animator, film critic, sports reporter, or photojournalist, the College of Mass Communication and Media Arts will provide you with the knowledge, tools, and opportunities to pursue these careers and many others. International media scholars, industry professionals, and dedicated support staff make it their priority to provide support both in and out of the classroom to ensure students excel at SIU and beyond. Whether it's winning Emmy Awards, National College Television Awards, Illinois College Press Association Awards, writing for the Daily Egyptian, or delivering ESPN3 broadcasts, our students stay busy. They regularly participate in internships and externships around the country in major media hubs, including Chicago, New York, Los Angeles, and Nashville, with the assistance of the College's team of advisors and coordinators. MCMA is also home to WSIU Public Broadcasting, the region's PBS and NPR affiliate, and they provide a number of paid and unpaid opportunities for students to get involved. Additionally, more than 20 media-focused student involvement groups and RSOs provide students with a chance to practice their craft, engage in meaningful discussions about media, and share research. 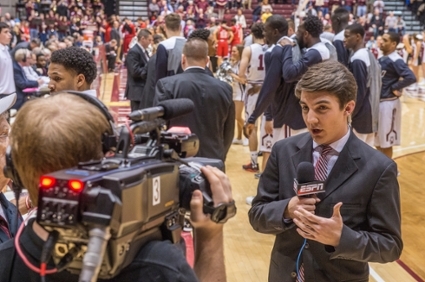 Check out our featured video on the the new ESPN3 sports production truck! Admission to the College of Mass Communication and Media Arts is on a rolling basis. Students who meet regular admission criteria are admissible directly into MCMA. Check out the Admissions website for more information on admission criteria for freshmen and transfer students. International students should contact the Center for International Education for more information about admission to the University. A variety of financial aid is available to College of Mass Communication and Media Arts students. Be sure to complete the FAFSA after October 1 and the SIU General Scholarship Application before February 1 to be considered for both need- and merit-based awards. If you have a parent that graduated from SIU, live in one of our border states, or reside in southern Illinois, you may qualify for an alternate tuition rate. All incoming MCMA students are encouraged to live in the College's Living Learning Community (LLC) in West Campus on beautiful Campus Lake. Just minutes from the Communications Building, our LLC is the perfect place for new students to meet friends, network, and stay connected. Our advisement team is here to answer any questions you have about their departments, classes, transferring credit, and visiting campus. Contact them today! Interested in meeting a MCMA faculty member or touring our facilities? Register for an individualized visit or Open House today! In addition to touring campus and meeting with Admissions, you'll have the chance to see our studio spaces, New Media Center, cinema soundstage, and more. While earning your degree, you can participate in media production and studies of all kinds through our student involvement groups and RSOs, internships, or study abroad. From working on an Emmy Award-winning TV show, to writing for the student-run newspaper, to doing live newscasts for the region's PBS station, students have the opportunity to practice their skills in many ways. Each fall semester, the College hosts the MCMA Involvement Fair where new students have a chance to learn more about all of these opportunities.